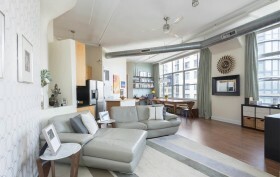 Here’s a two-bedroom condo from the Toy Factory Lofts, the former home to Tudor Metal Products. From the 1920s to the 1980s, the company, known for designing the popular Depression-era toy Budget Bank and the board game Electric Football, occupied the factory. Today, it’s a 56-unit residential building in Downtown Brooklyn that holds a gym, parking garage and a rooftop deck. This lofty apartment has a big wall of oversized factory windows, not to mention exposures to the east and south that bring light into the open space.